New Haven drivers are distracted for much longer than originally thought, according to a study released by AAA. Using hands-free technology can cause mental distractions for as long as 27 seconds afterwards. This development is concerning to New Haven motorists as it shows that even once-thought simple movements, like changing the radio station or adjusting the volume control, can leave the driver distracted for up to 15 seconds. Voice-activated systems, like texting, phone calls, Google Now or Siri, leave the driver distracted. This study urges drivers to avoid this type of behavior even stopped at a light or stop sign as the distraction can overlap when the light changes. A Connecticut lawmaker is holding a series of forums on distracted driving later this week to discuss how while we understand these behaviors are dangerous, action to stop them is is not as quick to catch on. Distracted driving can lead to a significant New Haven auto accidents, pedestrian accidents, motorcycle accident, or bike accident. The New Haven auto accident attorneys at The LoRicco Law Firm urge you to focus solely on driving when operating a motor vehicle. New Haven pedestrian accidents occur often and everywhere often leaving the injured with a wide range of injuries. Below is the most common places pedestrian accidents occur. Crosswalks. Occurs when a pedestrian is legally in a crosswalk at the time of the accident and a vehicle fails to give pedestrians the right-of-way, striking them within the crosswalk. Parking Lot/Backover. When a vehicle is backing up, such as pulling into or out of a parking space, and strikes a pedestrian while in reverse. Back-over accidents are common in parking lots when cars may be blocking a driver’s view to the left or right and shoppers are quickly and consistently crossing the path of parked vehicles. Loss of Control. This type of accident includes sideswiping a pedestrian on a sidewalk or hitting a pedestrian after the loss of control of a vehicle. Many times such accidents can result in a pedestrian being “run-over” and trapped under the vehicle or crushed between the vehicle and another unmoving object, such as another vehicle or a building. These accidents are some of the most dangerous to the life and health of pedestrians. If you or a loved one was injured in an accident, the New Haven personal injury lawyers at The LoRicco Law Firm can help you protect your long term interests. Call us today to schedule your free consultation. 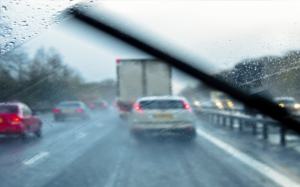 Spring rain storms can be can be very strong and drop lots of rain on New Haven roadways so it is no surprise that weather can be a contributing factor to New Haven auto accidents. Take extra precautions when traveling in wet, stormy weather. Do run your defroster to keep your windows and windshield clear. Do travel at safe speeds. Staying under 45 mph will keep your car from hydroplaning. Do turn on your headlights when your wipers are in motion. It’s required by law. Don’t wait to replace your windshield wipers until the next rain storm if they aren’t clearing your windshield. Don’t drive through large puddles. They can damage your electrical systems in your car. Don’t be afraid to pull over if the rain is coming down too hard. If you or a loved one was injured a New Haven auto accident attorney may be able to help. The attorneys at The LoRicco Law Firm have been helping New Haven and the Connecticut shoreline’s injured for nearly 60 years. Contact our office today to a schedule your free consultation. National Work Zone Safety Week continues to raise awareness for those workers, like first responders and tow truck workers, who are at an increased risk of getting hit by a vehicle while performing work duties. Connecticut has a Move Over Law that requires motorists to move over, if it is safe, to allow these workers space to work. Below is some crash data for the Connecticut. If you or a loved one was injured as a result of a crash, contact our New Haven auto accident attorneys to protect you and your family’s long term interests. 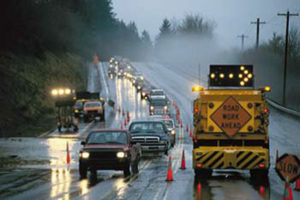 This week is National Work Zone Awareness Week. Now that spring is here, construction season is in full swing. More and more road construction projects will be popping up in New Haven as well as the Shoreline area and it is important to obey traffic laws to keep not only yourself safe, but the construction workers along the side of the road. 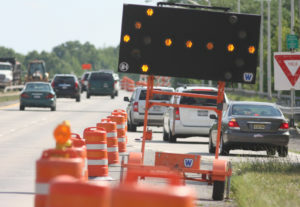 While construction projects are welcomed because it means our roadways are being maintained, it also can cause uneasy feelings among New Haven motorists. New Haven auto accidents can occur because of: Motorists not following posted speed signs Narrowing lanes Machinery/equipment in areas it should not be Incorrect placement of barricades Construction debris in the travel area If you or your loved one was in an accident, consult with a New Haven auto accident attorney. Our experienced attorneys are used to dealing with big insurance and will fight for your case. Contact our firm to schedule your free consultation.